I’ve been going to a lot of book signings lately and I thought I would do a big list of the most important tips I’ve learned from attending them. If you’ve never been to a book signing before, this post will give you a ton of tips and information about them. And if you have, I’m sure you’ll find something new, too. 1. Should I buy the book at the store or before hand? It depends. Certain bookstores will require you to buy the book there in order to attend the signing, while others would like you to buy the book there but don’t require it. It’s smart to call the bookstore ahead of time and ask them if you need to buy the book there to get it signed. If you already own a copy of the book, you might have to buy another. Barnes and Noble requires you to buy a book there to go to the signing. 2. What time should I show up? It depends. Is this author a New York Times bestseller? Do they have a really big fandom? If so, it’s safe to say people are going to show up early. For example, when I met Kiera Cass (author of The Selection), people had been waiting outside the store before it even opened. I showed up an hour early and all the seats were filled. A few authors that I know this also happens with are Sarah J. Maas and Cassandra Clare. I usually plan to get to events with a big author at least an hour early. My friend and I went to Morgan Matson’s signing for The Unexpected Everything an hour early and we got front row seats. If the author is smaller, it’s smart to show up at least ten minutes early so you can buy your book if you don’t already have it. One great way to tell how many people are going to be at a book event is through Facebook. Most bookstores will put up the event on Facebook so people can RSVP. If you see that over 100 people are going, plan to go early. You can also call the bookstore before you leave to see if people are there yet. If the event is at Barnes and Noble, show up as soon as the store opens to make sure you get a wristband. Basically, Barnes and Noble uses a wristband system to organize how many people can come to their events. For the Sarah Dessen book signing I went to, only the first 20 people to buy the book got a wristband and seat. So if one of your favorite authors is doing a B&N event, you need to buy the book at the store as soon as the store opens the day of the signing to get a wristband. Book signings are a great place to meet people! I actually made a new bookish friend at a signing for The Thousandth Floor by Katharine McGee last week. You’re in a room full of people who love the same author and books as you! No one is going to judge you for fangirling about books! These people get you! 4. 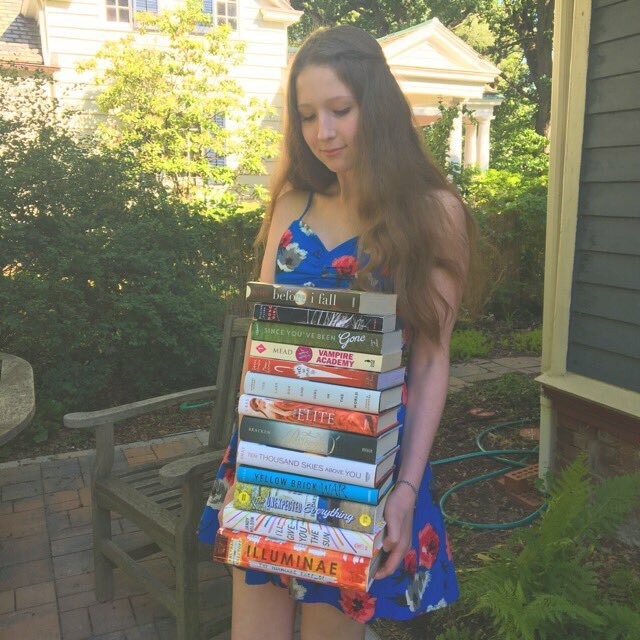 How many books by the author should I bring? It’s smart to call the bookstore ahead of time and ask them how many you will be able to get signed, BUT I would bring as many as you have by the author. I brought seven books to the Sarah Dessen signing, and even though Barnes and Noble staff told me I could only get three signed, she signed all of them anyways. Usually authors will sign as many books by them that you bring. 5. Should I get my book personalized? Unless there’s a ton of people at the event, you can get your book personalized. The only time I haven’t been able to get my book personalized was at Kiera Cass because there were so many people. An employee of the store will write your name on a post it note and put it on the page next to the title page, so the author can see how to spell your name. Most authors have something that they write when they’re signing books along with their signature. For example, Morgan Matson’s is “all my best.” If you have a favorite quote by the author, you can ask them to write that, too. Just a note: these tips don’t apply to book conventions like Bookcon or BEA. I’ve never been to either, but from what I’ve heard you shouldn’t bring a ton of books for authors to sign with you. I’m going to Bookcon in October, so I’ll make a “Beginner’s Guide to Bookcon” post after. Have you ever been to a book signing? What was the best book signing you’ve ever been to? Thanks for the tips for the future! Aw that’s the worst 😦 I hope you get to go to one for her in the future!! Thank you! Me too, I need to start checking out when authors come close to me 🙂 Your post makes me want to experience a fun book signing! Yes, you should definitely keep your eye out! Great advice! Thanks for this post. I’ve been to BookCon signings but I’m going to my first bookstore signing in a few weeks to meet Leigh Bardugo. Ooh have fun!! I’m so glad I helped. Thank you! I’m glad you have fun at them, too! Awesome post! I have been the *three* Sarah J. Maas signing because I am a complete and utter fangirl. The first one she was signing with Samantha Shannon (The Bone Season), the second one Susan Dennard (Truthwitch) who I also absolutely love, and the third time with Kara Thomas. It was so great to meet all of them in person, and like you said I met so many amazing people who share my bibliophilia!